The patient had been well until three years earlier, when she began to have frequent episodes of epistaxis. Two years before admission, mild abdominal distention developed. Periodic examinations by her physician were reported to have revealed no abnormalities. Two months before admission, the abdominal distention worsened but was not accompanied by abdominal pain. Physical examination revealed hepatosplenomegaly. 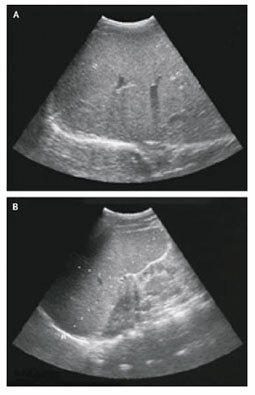 An abdominal ultrasonographic study confirmed the presence of hepatosplenomegaly, without evidence of portal-vein thrombosis. The results of liver-function tests were normal or nearly so, and tests for viral hepatitis A, B, and C were negative. Three days before admission, pain developed in the right thigh, and on the following day the patient was unable to walk because of pain. She was admitted to the hospital. She resided with her parents and three siblings, who ranged in age from 14 to 17 years. She used no medications. She recalled having had pain in the right leg about one year earlier; it had resolved spontaneously. There was no history of previous hospital admissions, sickle cell disease, recent travel, trauma, fever, night sweats, anorexia, weight loss, jaundice, hematemesis, vomiting, diarrhea, cough, arthralgia, easy bruisability, or bleeding gums, and there was no family history of bleeding disorders, hemoglobinopathy, hepatic disease, inflammatory bowel disease, autoimmune disease, or thyroid disease. The temperature was 38.6°C, the pulse 93 beats per minute, and the respiratory rate 18 breaths per minute. The blood pressure was 130/75 mm Hg, and the oxygen saturation was 99 percent while the patient was breathing ambient air. On physical examination, the patient was thin but did not appear acutely ill. No jaundice, rash, or scleral icterus was seen. Shotty anterior cervical lymph nodes were palpated. The oropharynx and lungs were normal. A grade 1 systolic ejection murmur was present along the left sternal border. The abdomen was distended, and the navel protruded; a nontender liver edge descended to the pelvic brim and crossed the midline, and the splenic tip was 5 cm below the left costal margin; no shifting dullness was found. There was tenderness over the proximal portion of the right femur but not over the right hip and knee; there was full range of passive motion of the knee and hip, although knee extension was painful. No erythema or local warmth was noted, and the knee was not swollen. The sensation of a light touch was preserved, and motor power was intact, except that the leg pain was severe enough that the patient would not voluntarily move the right knee and declined to have her gait tested. Neurologic examination revealed no evidence of extraocular eye-movement abnormalities, ataxia, cognitive difficulties, or other abnormalities. 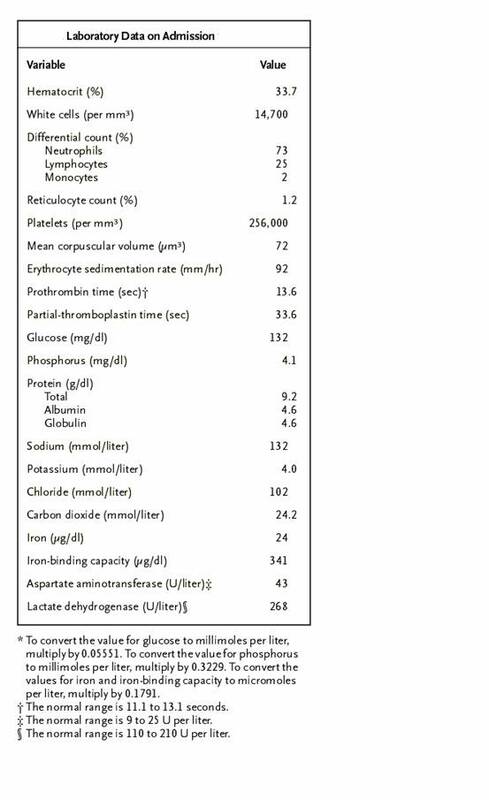 The urine had a specific gravity greater than 1.030 and was positive (+) for protein and trace-positive for ketones. Laboratory values are reported in. There was microcytosis (+++) with anisocytosis (+); the white cells were normal. Hemoglobin electrophoresis showed 62 percent hemoglobin A and 35 percent hemoglobin C. The levels of urea nitrogen, creatinine, uric acid, conjugated and total bilirubin, calcium, magnesium, and alkaline phosphatase were normal. Radiographs of the right femur, hip, and lower right leg were unremarkable. A radiograph of the chest obtained while the patient was supine revealed that the lungs and pleural spaces were clear and that the mediastinal contours and bones were normal. A computed tomographic (CT) study of the abdomen and pelvis, performed after the intravenous injection of contrast material, disclosed patchy sclerosis in the left femoral head, suggesting avascular necrosis. A moderately large effusion was present in the right hip joint, and the bone marrow had the density of soft tissue rather than fat, indicating replacement of the marrow fat by an infiltrate. There was marked hepatosplenomegaly, and several retroperitoneal lymph nodes larger than 1 cm in diameter were visible. The gallbladder, kidneys, pancreas, adrenal glands, and large and small bowel were unremarkable. A magnetic resonance imaging (MRI) study of the pelvis and femurs showed a moderate effusion in the right hip and abnormal enhancement in the synovium and soft tissues surrounding the proximal portion of the right femur and hip. T2-weighted and short tau inversion-recovery images revealed edema in the soft tissues around the right hip. (The short tau inversion-recovery technique suppresses the high-signal intensity from fat and is useful in displaying fluid.) T1-weighted images disclosed a uniformly low signal intensity in both femurs, the pelvis, and imaged areas of the spine. No evidence of osteomyelitis or knee joint effusion was detected. There was faint abnormal enhancement of bone marrow in the proximal right femoral diaphysis, and the marrow appeared brighter than muscle on the special images, a finding believed to be indicative of bone marrow edema. A sharp zone of transition in the femoral shaft, between enhancing marrow distally and nonenhancing marrow proximally, suggested the possibility of an extensive bone infarct within the proximal right femur. The patient's pain was relieved by administration of a potent analgesia. Each day during hospitalization, the temperature rose as high as 37.4°C but was normal at times. Antibiotic therapy was not given. A urine culture yielded a few mixed bacteria, and a blood culture was sterile. The results of additional tests were pending. Which diagnostic procedure must be performed?